Back in the heady days of 2006 some 30,000 cranes, roughly a quarter of total global capacity, were busy whirring away in Dubai. Today most of these devices have either left to find service in other parts of the globe, or lie silent, unused and unloved. In what is only the latest sign of the ongoing property snarl-up affecting the emirate Nakheel, Dubai Worldâ€™s property developer subsidiary, asked on Wednesday for a delay in their next debt payment. The move was widely seen by investors as a technical default, raising concerns about investment in risky assets right across the globe. So while their company slogan may well be that the sun never sets over Dubai World, the fact is that Dubai Worldâ€™s sun not only no longer shines, it is suffering from something more like a total eclipse. According to the last reckoning, government owned Dubai World has some $59 billion in outstanding liabilities, making the company responsible for the lionâ€™s share of the total $80-100 billion in estimated Dubai state debt. Up to now all maturing government-linked debt has been paid off in full, with government funds making up any shortfall in private funds. But the latest announcement suggests that weaknesses in the global property sector and vulnerability of the emirateâ€™s economic model is leading the government to have second thoughts, and the clear impression is that Nakheel could be a very different story given the government’s expressed intention of supporting only viable companies. More than the scale of the issue, the problem this week in Dubai has been the uncertainty created, the underlying lack of transparency about the state of corporate and national finances and about exactly which debt will be honored, and above all about whether or not other countries â€“ both within and outside the region – will be affected via the process known to financial analysts as contagion. The consequences of the present payment standstill are wide ranging, as would be the impact of any eventual default. The repayment of Dubai World’s $4 billion Nakheel bond was seen by investors as a key test for the emirate’s ability to deal with the rest of the $80 billion or so owed by the government and its state-controlled companies. Dubaiâ€™s ability and willingness to do just this is what is now in doubt, and the way the process has been handled so far is leading to all manner of investor speculation. The blow caused by the announcement was initially softened by news earlier the same day that the government had raised $5 billion from Abu Dhabi banks, but this optimism was soon dented as it sank in that the figure was considerably less than what the emirate had been hoping to attract from external investors and the sequencing of the two announcements is interpreted as suggesting that the Abu Dhabi money will not be spent on companies like Nakheel and Dubai World. Indeed Dubai’s growing problems had been evident for some time, with the credit rating agencies sharply downgrading Dubai government-owned corporations over the last year as expectations for the extent of likely government support have declined. Earlier this month Moodyâ€™s cut the ratings on Dubai Ports World, and Dubai Electricity and Water to Baa2 (junk status) from A3 and downgraded 4 other government linked companies, with the agency noting in its press release that the debt restructuring plan “highlights the government’s intention to strictly adhere to its stated policy of supporting only those companies with viable long-term business prospectsâ€. The question is, of course, now that the emirate’s lop sided growth model has been shown to be completely dysfunctional, what are the viable long term business prospects in a city with so much excess capacity as far as property goes. According to the Dubai Statistics Center, the total population was 1,422,000 as of 2006, of which 1,073,000 were male and only 349,000 were females. Evidently activity associated with the construction industry can offer some part of the explanation for this massive gender imbalance. Just under 20% of the population are estimated to be UAE nationals. Approximately 85% of the expatriate population (and 71% of the emirate’s total population) is thought to be Asian, chiefly Indian (51%), Pakistani (15%), Bangladeshi (10%). This impression of a large construction industry oriented population is reinforced by the economic data. Although Dubai’s economy has been built on the back of the oil industry, revenues from oil and natural gas currently account for less than 6% of the emirate’s revenues. It is estimated that Dubai produces 240,000 barrels of oil a day and substantial quantities of gas from offshore fields. The emirate’s share in UAE’s gas revenues is about 2%. But Dubai’s oil reserves have diminished significantly and are expected to be exhausted in around 20 years. Real estate and construction account for about 23% of GDP and financial services for another 11%. Assuming many of the builders will now leave, it is hard to see what the future actually holds. Like countries a lot nearer to home – Spain, Ireland, the Baltics – it is hard to know what exactly to do with an economy which has been totally distorted by construction activity, and unsustainable building and price rises. And of course Dubai’s problems are a lot larger than anything which is to be found in Europe. Aside from the Dubai issue itelf the big worry now is possible contagion to other markets, with Central and Eastern Europe in the forefront of everyoneâ€™s mind, given the overlap in bank exposure. 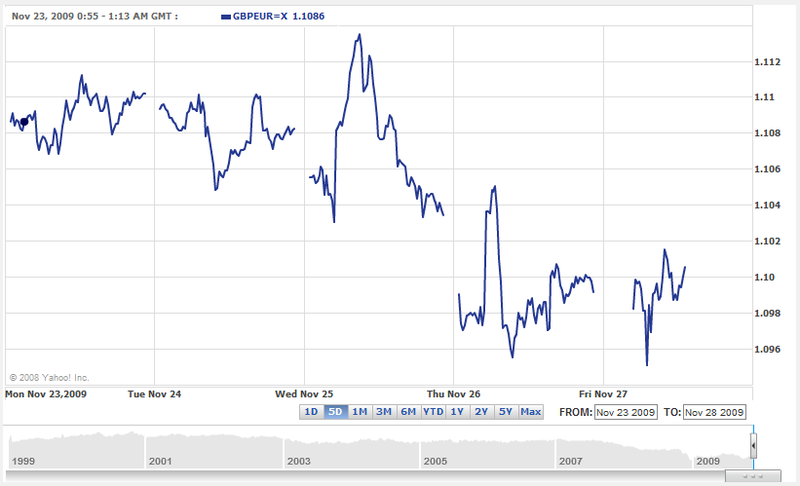 The announcement also lead to a sharp a drop in the value of the UK pound (hat-tip to Izabella Kaminska at FT Alphaville – see chart below) on the fear that the Dubai government could be forced into a rapid sale of its international real estate, since the emirate is perceived as having extensive UK property holdings which market participants (rightly or wrongly) think may be in danger of going under the hammer in a move which could clearly have implications for the UK property market, and the banks that have exposure to it. In total European banks are estimated to have some $40 billion of exposure to Dubai with Standard Chartered leading the group according to research from Credit Suisse. HSBC Holdings, Barclays, Royal Bank of Scotland Group and Lloyds Banking Group also have some, significantly lower, exposure. Since the decision to halt payments has raised fears of the largest sovereign default since Argentina 2001, most of the attention has been focused on sovereign debt issues, and these, of course, extend far beyond the Middle East itself. In particular European bond market worries grew over the ability of riskier government borrowers from Russia to Greece and Italy to pay back their debts in the longer run. And it is just here that one of the long term consequences of what happened this week in Dubai can be found, since with government after government pressing the accelerator pedal hard to the floor on the stimulus front, and digging ever deeper into the public purse to plug gaps in the bank balance sheets, the perception that paying back all the accumulated debt may be harder than expected, especially with ageing population problems to think about, is now gaining traction among investors. And once sovereign debt default fears really come up over the investor radar, it is going to be very hard work to remove them. Greek sovereign debt in particular is attracting a great deal of attention, and this week one historic milestone has been passed, since the cost of insuring Greek debt for the first time equalled that of insuring equivalent Turkish debt. At first sight this is very shocking news, since as recently as 2007, the Turkish CDS spread was trading at about 500 basis points on perceived fiscal risks. The Greek spread, by contrast, was nearer 15bp. The country is, after all, a member of the European Monetary Union, and its euro-denominated bonds were considered effectively protected by other euro states. But over the past year the fiscal position of many emerging markets nations, Turkey among them, has become more favourable, while that of some Eurozone countries, including Ireland and Spain as well as Greece, has steadily deteriorated. Evidently – as the Financial Times’s Gillian Tett points out – such comparisons, apart from constituting a fairly bitter blow to Greek pride, raise a much bigger issue, one which goes straight to the heart of the Dubai saga. Two years ago, global investors generally did not spend much time worrying about the risk that seemingly remote, nasty events might occur. But the financial crisis has changed this perception. Having had their fingers badly burned once, investors are eager not to have it happen a second time, which is why what is happening in Dubai now makes them nervous, and why Europeâ€™s governments would do well to think more about the future, and especially about ensuring that we donâ€™t see Dubai like events starting to happen much nearer to home. on the fear that the Dubai government could be forced into a rapid sale of its international real estate, and since the emirate has extensive UK property holdings which might go under the hammer any such move would clearly have implications for the UK property market, and the banks that have exposure to it. I’m not breaching commercial confidences, as this is all public info, to say that Istithmar’s UK portfolio, IIRC, was Grand Buildings in Trafalgar Square, the Adelphi Buildings nearby, an industrial estate near Heathrow, Marcol House (which was sold recently), Turnberry golf course and the few residual stubs of P&O’s real estate developments. OK, thanks Richard, you obviously know more of the situation on the ground than I do, so what we are talking about here is the perceived (as opposed to the actual) risk. Which is also interesting, since it does indicate just how sensitive markets are right now to the perception that someone might start offloading swathes of commercial or industrial property. Interesting in itself I think. But as some lose creditworthiness don’t the others profit? Investors are not going to let the money rest unused, are they? Ah, don’t mind my pedantry, please. It’s actually the second-order effects of a firesale of a few high-value London office blocks that are more concerning. 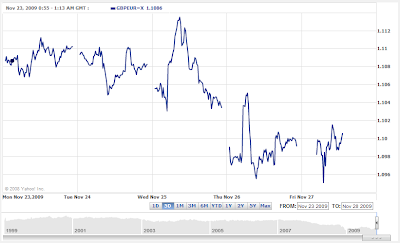 Since the credit crunch hit back in 2007, the GBP100m+ market has been pretty much dead. Although everybody’s been marking down the properties in the books (leaving most investors who’ve bought since, say, 2004/05 in technical breach of their loan covenants re: LTV, and in a few case, >> 100% LTV), these revaluations have been on the basis of very little evidence, so illiquid is the market. If some buildings get sold for much less than expected, it’s the domino effect as everybody’s forced to revalue down lower that’s the possible danger. I think Qatar has much more London real estate than Dubai. Barclays was apparently hurt as much by the Qatar connection (in its shares) as any potential exposure to Dubai. Which doesn’t make sense since Qatar has years of LNG exports to help finance its debts. Exactly Richard, this was my impression from afar, and sitting here in Spain next to a set of banks who have stocked up to the hilt on a massive quantity of empty property (with hardly a bad loan in sight), but with no one having any real idea of what the property is actually worth in what you call an illiquid market (ie there is hardly a buyer out there), the danger that somewhat might one day get forced into actually selling something makes me personally rather nervous. These arab sheiks suffering from “surreal schizophrenia”? Best read on Dubai World that I’ve seen. Kudos. P O’Neill> AFAIK, the Qataris have made direct investments into two very high-profile (one literally) trophy London properties (I worked on one of the transactions), but in terms of capital deployed, I think they’re probably in the same order of magnitude. That said, I don’t know how much investment the Qataris have put into private real estate funds, which was the historic way most Middle Eastern SWFs invested in UK property. Dubai making direct investments through Istithmar was something out of the ordinary by the standards of the region. ADIC, which is simply massive, has very rarely made direct investments into anything, but usually goes through intermediary funds. Minor point, but I’ve heard from fairly reliable local sources that the 20% local population is a massive overestimate, maintained by the government for political purposes, and the real figure’s about half that. IE ~10% of the population are actually nationals.